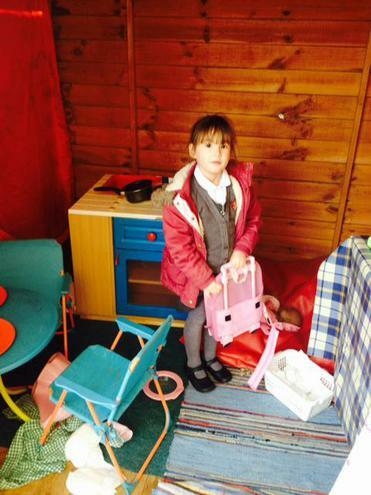 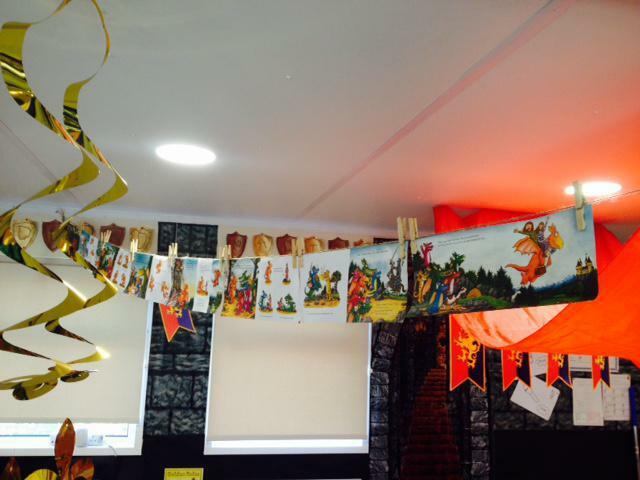 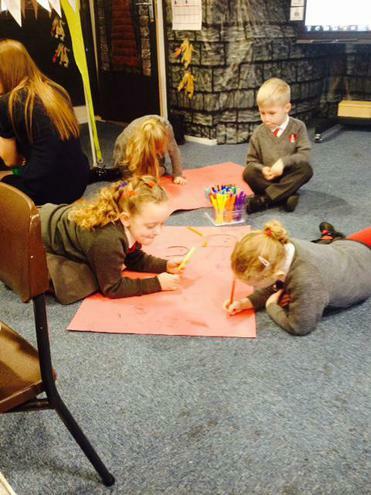 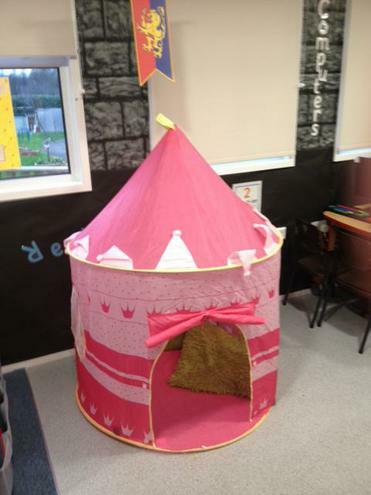 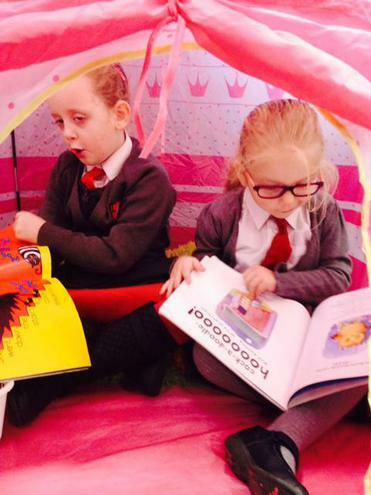 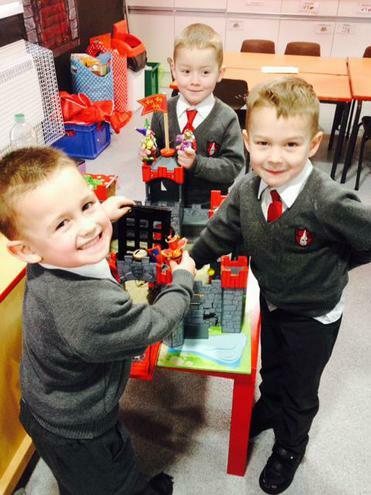 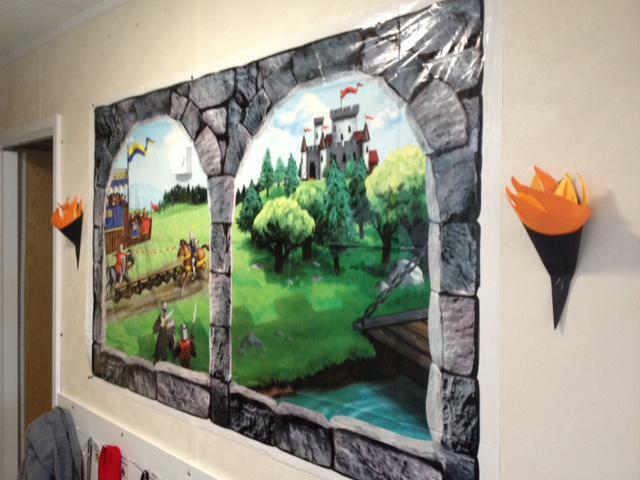 This term we are learning about life in a castle. 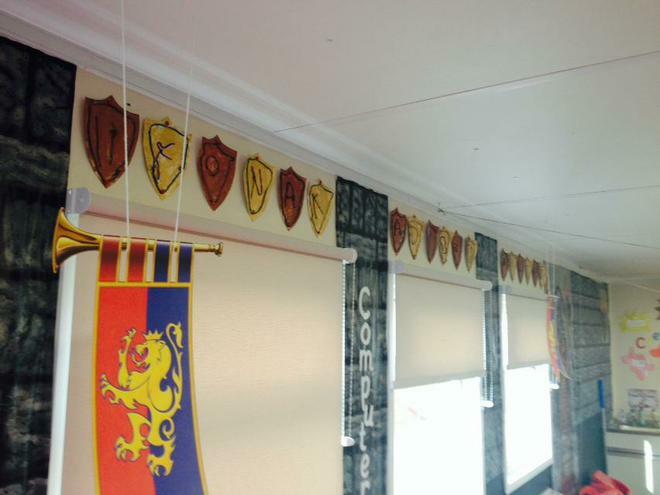 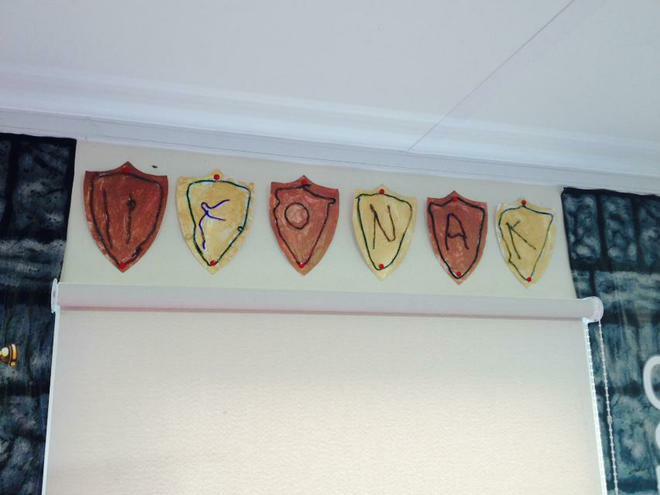 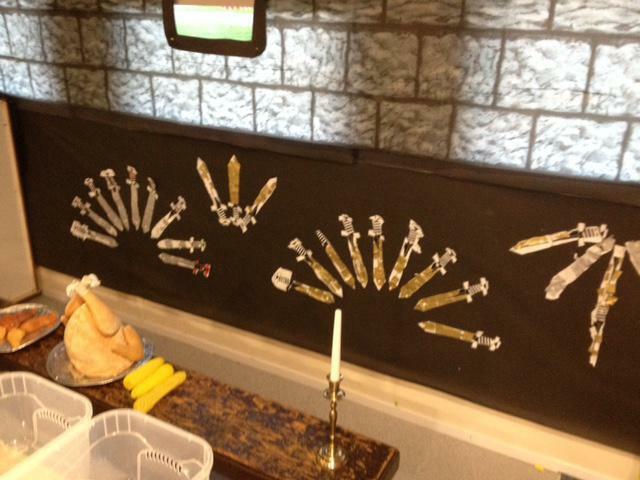 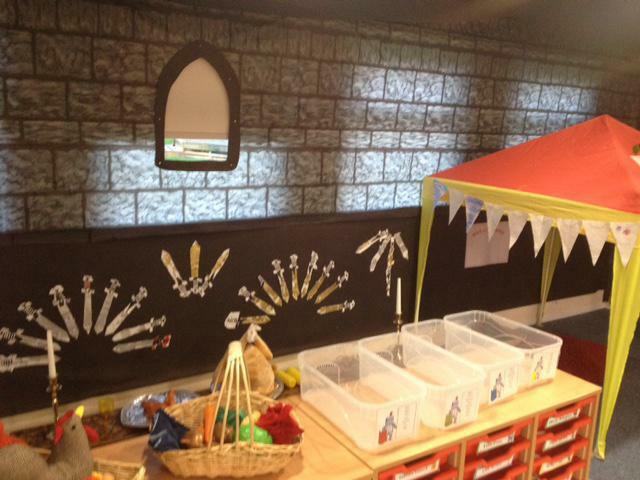 Our classroom is a castle. 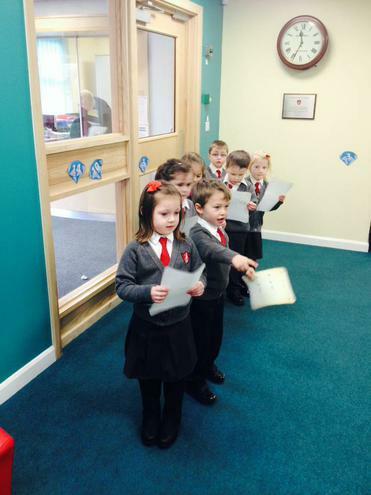 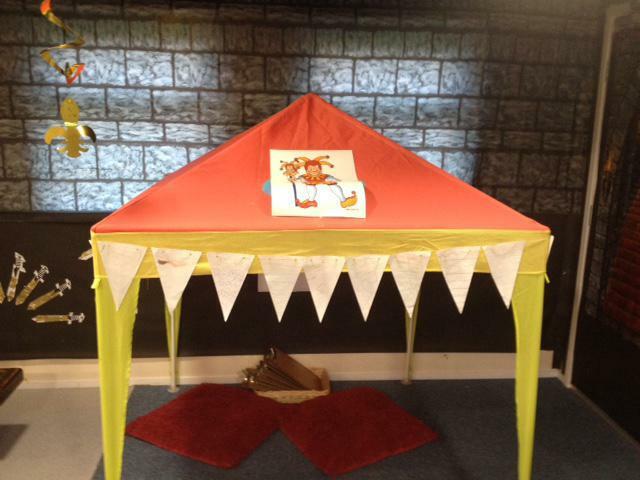 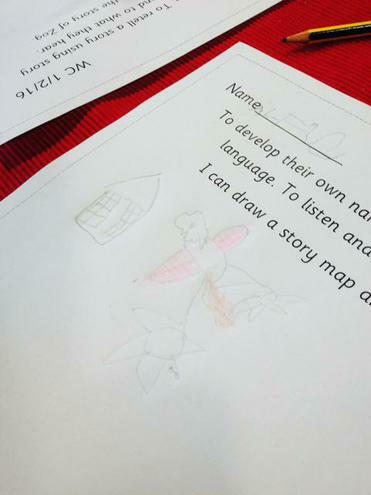 We enjoy signing in each day and choosing if we are going to be a Sir, Princess or Jester! 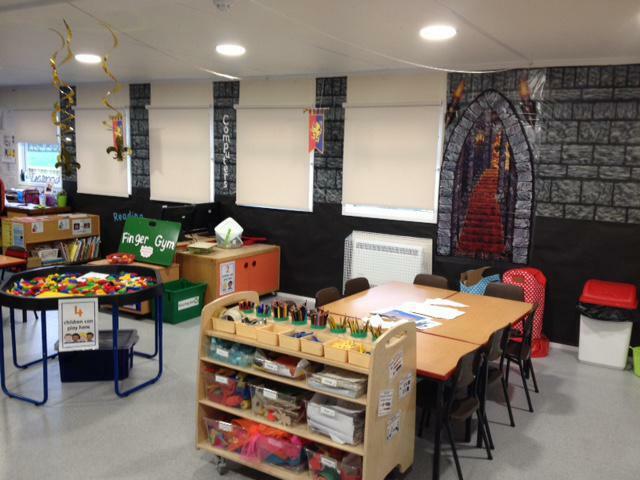 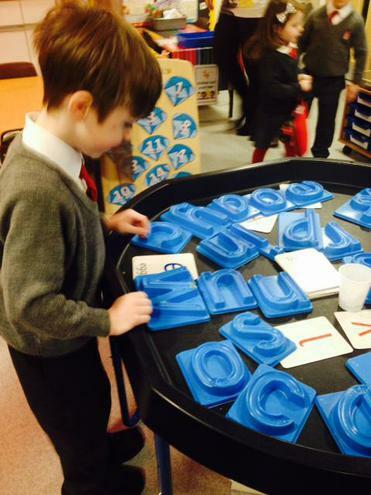 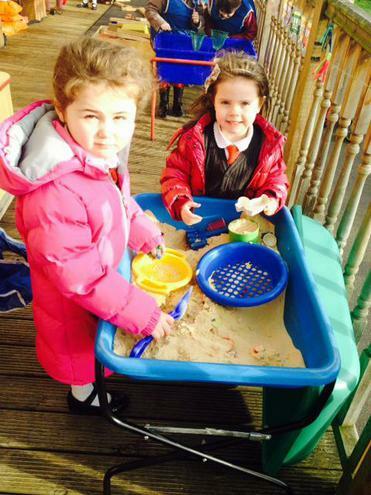 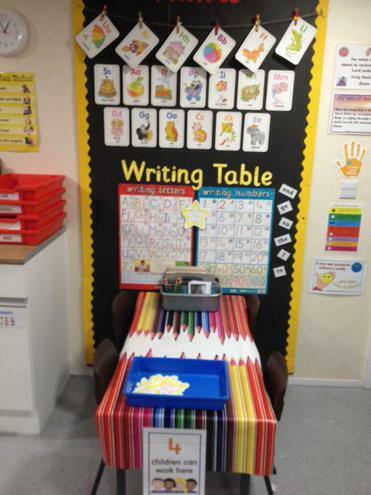 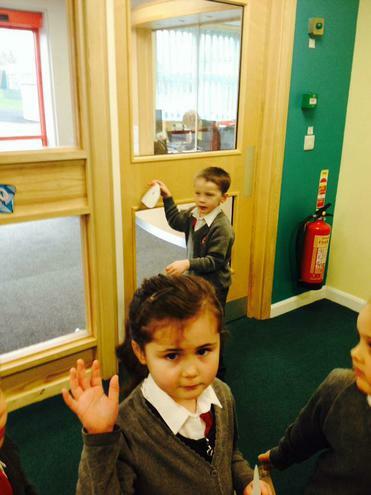 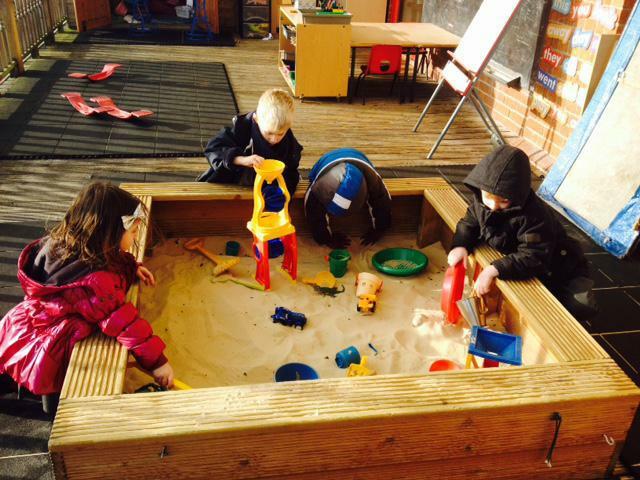 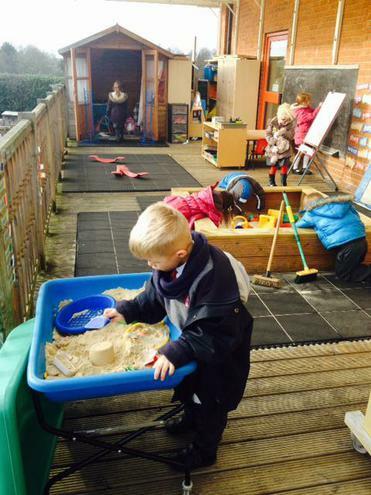 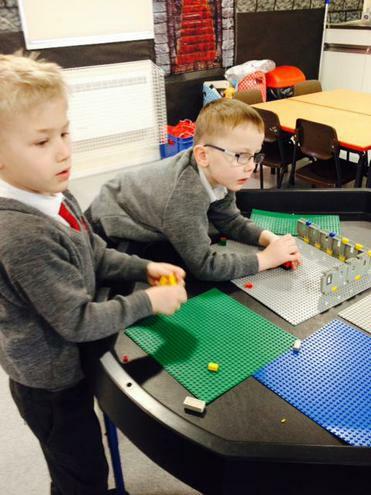 We love our new learning environment! 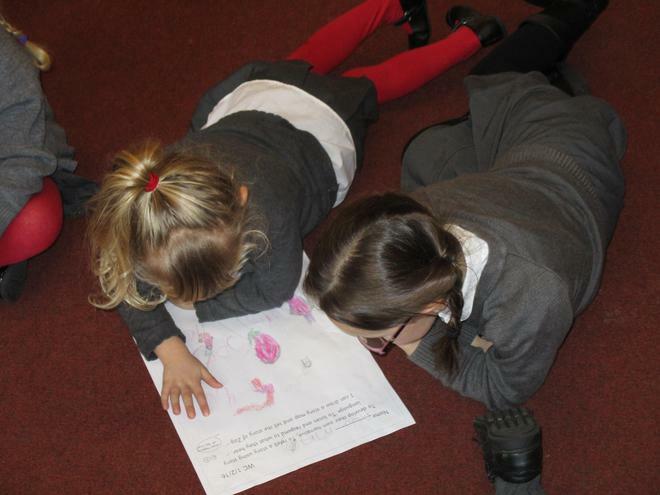 We worked in our groups, looking at books and pictures of castles, thinking about what they looked like, and what it would be like to live in one. 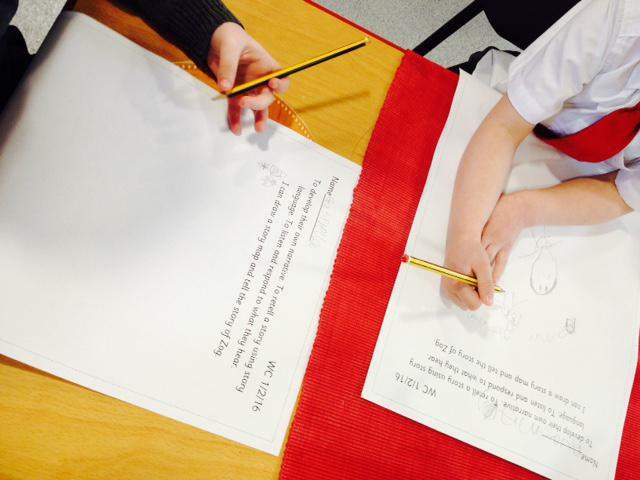 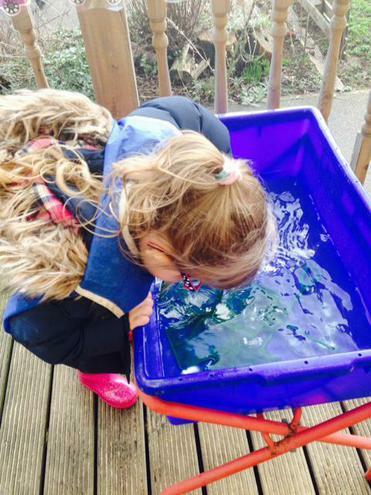 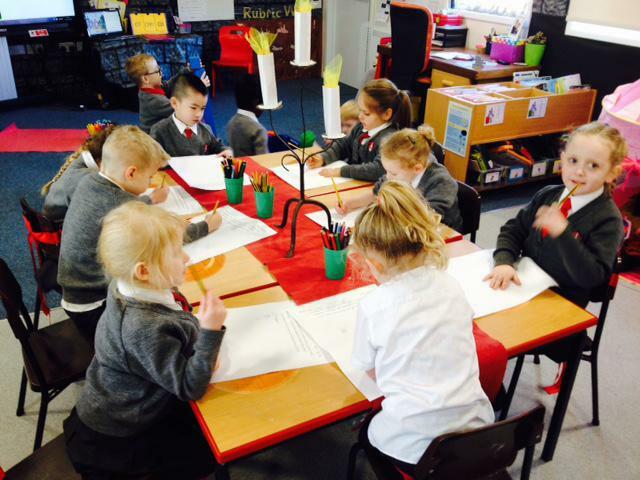 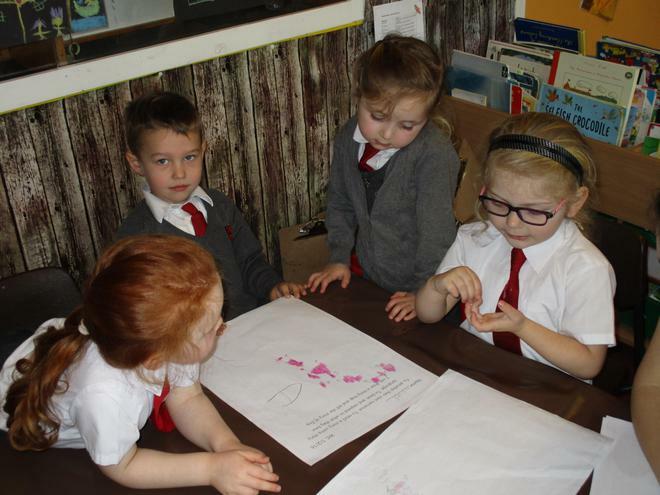 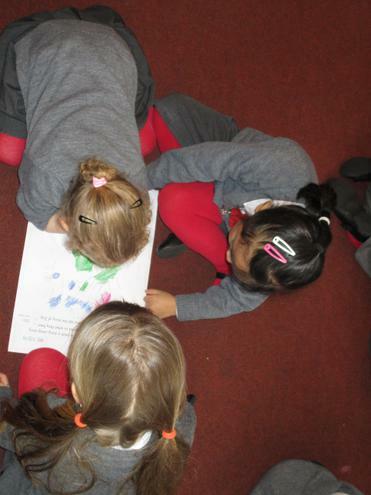 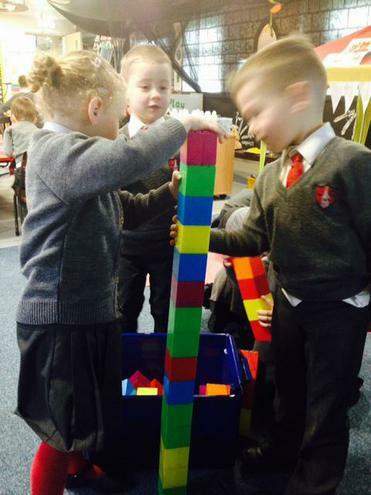 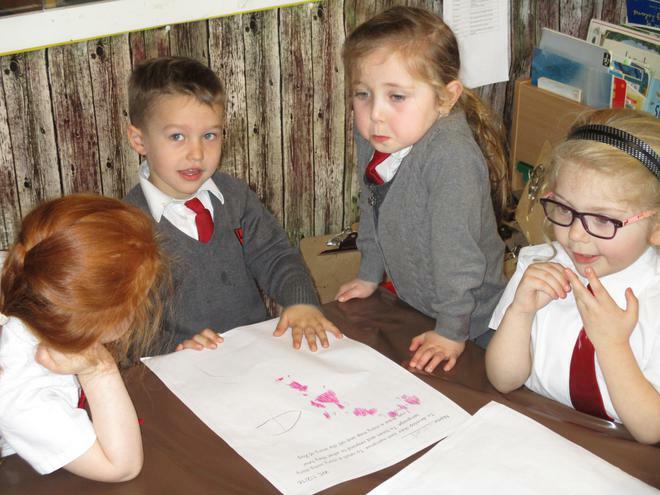 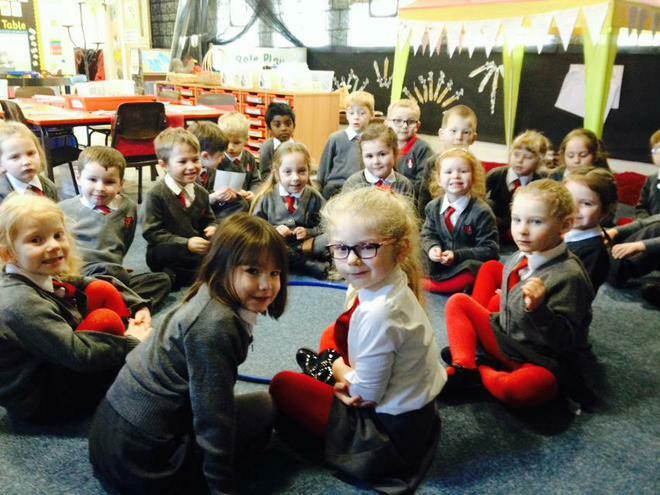 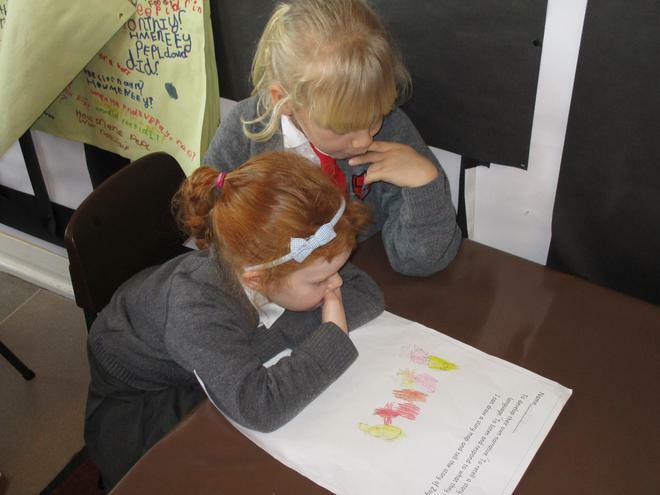 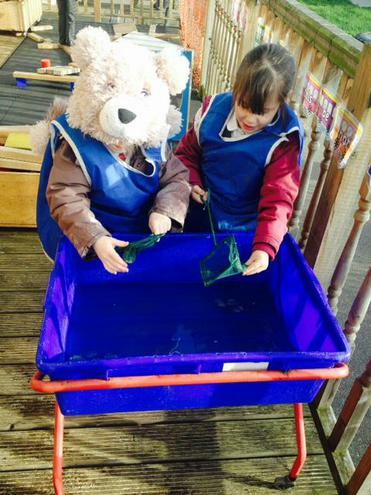 We all had lots of different ideas and took turns to share our thoughts, listening carefully to each other. 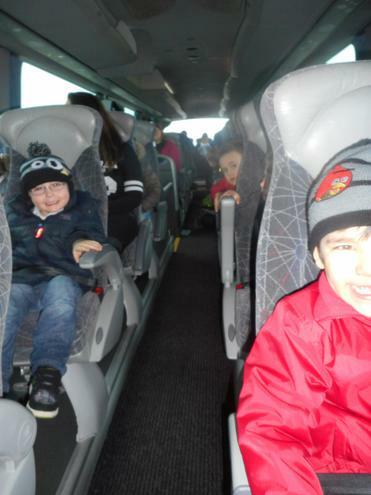 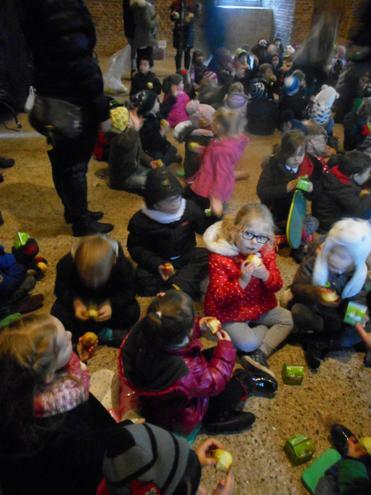 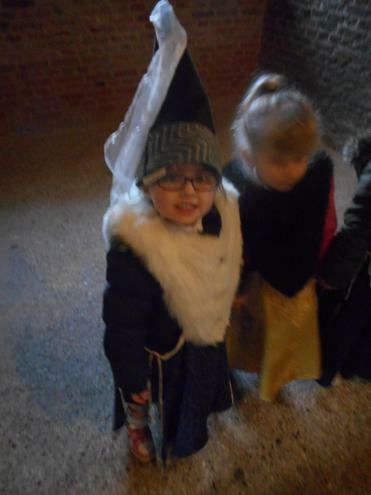 What a fantastic day we had at Tattershall Castle. 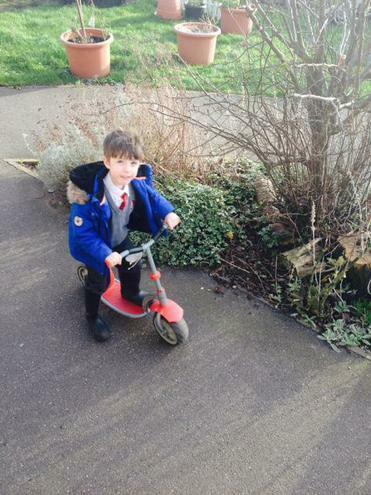 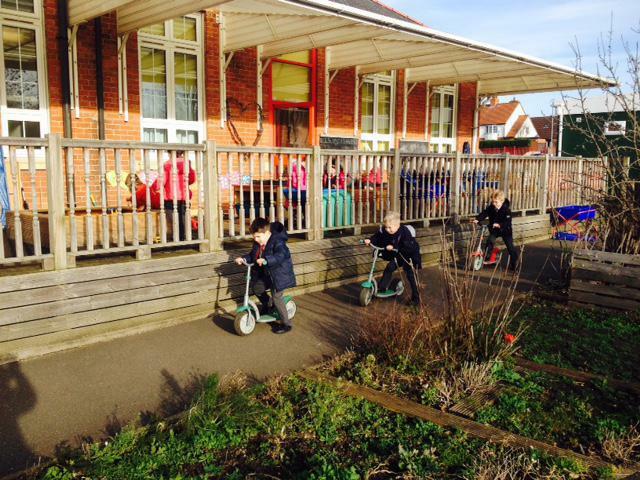 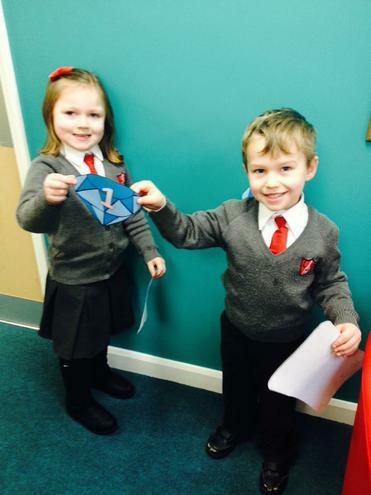 A BIG thank you to all our parent helpers - we hope you enjoyed it too! 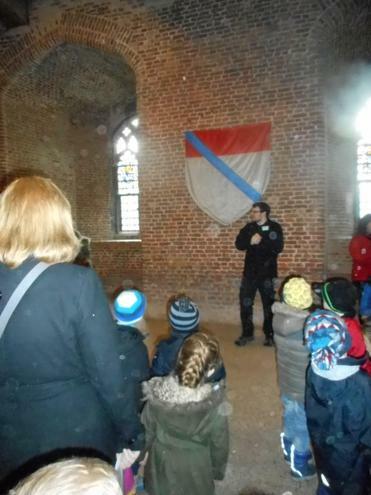 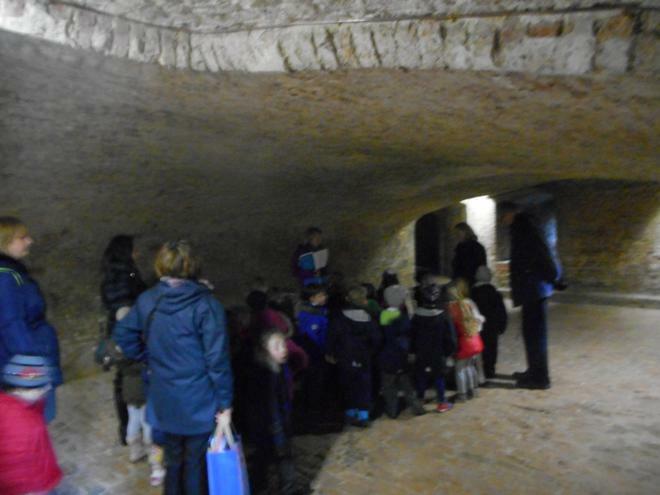 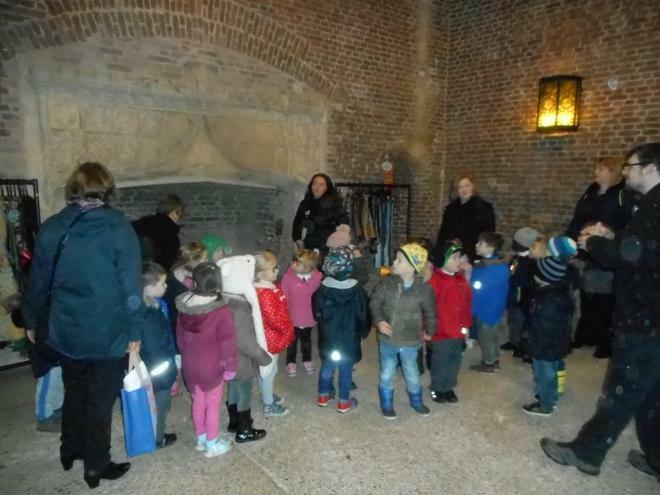 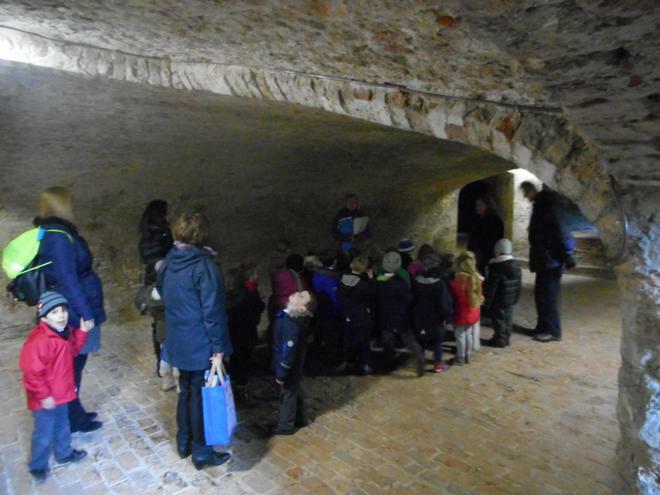 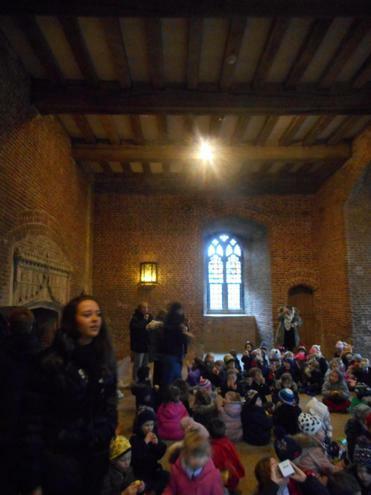 We were able to walk through the castle, looking at its high ceiling, stone floors and thick walls. 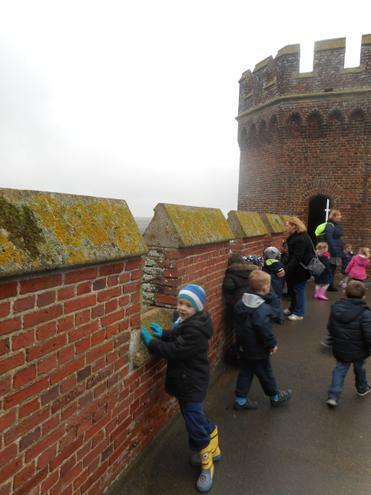 We walked along the roof and peered through the turrets. 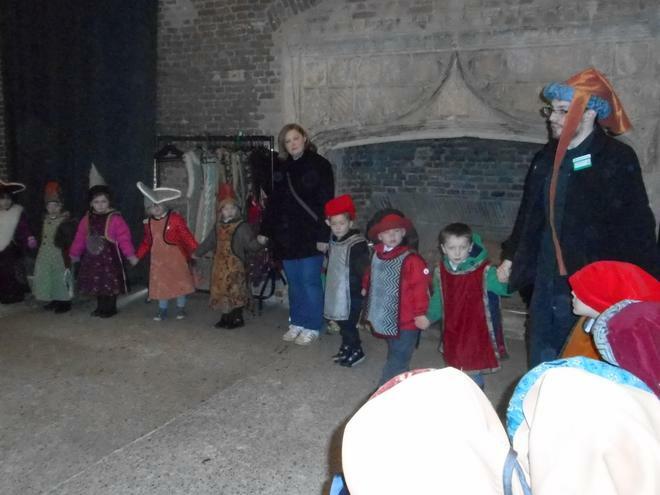 The steps were winding and slippery, and we had to be very sensible walking up and down them. 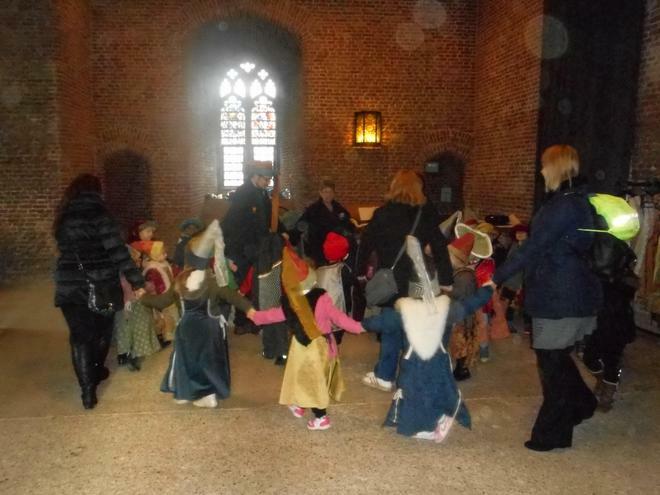 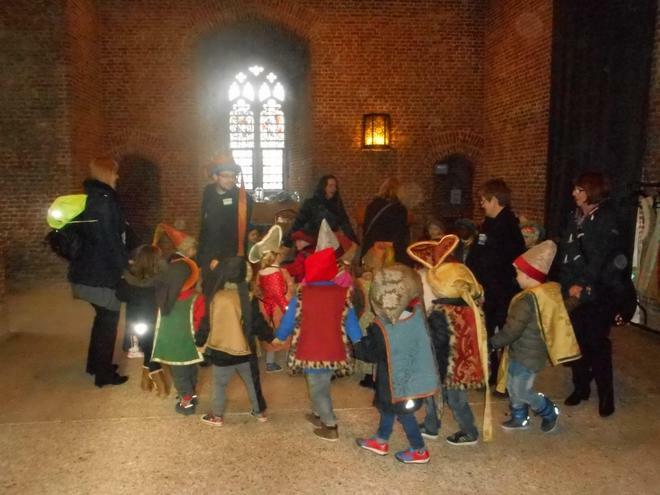 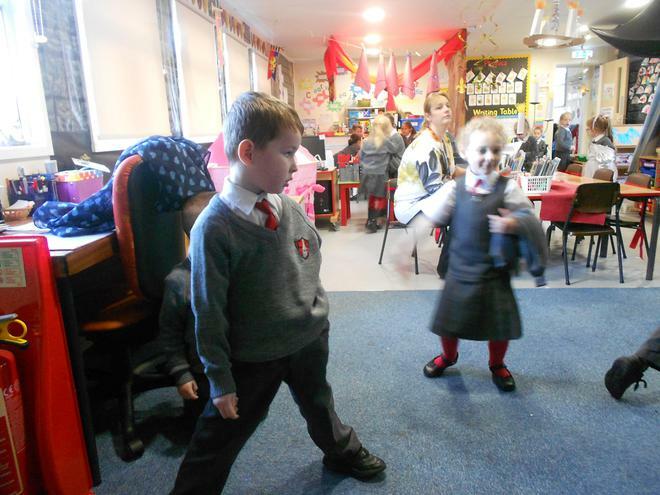 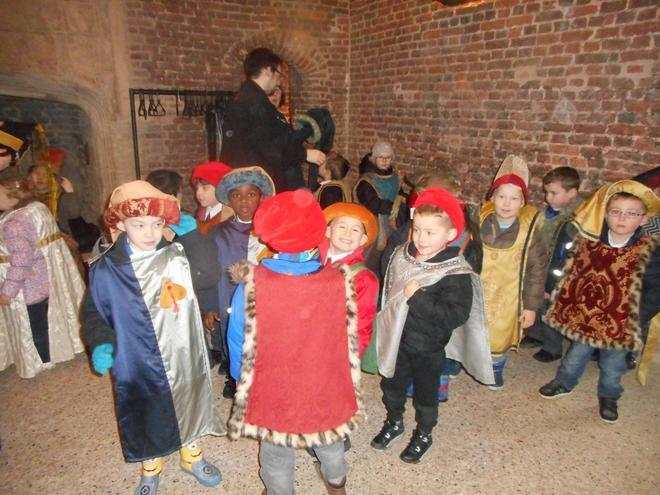 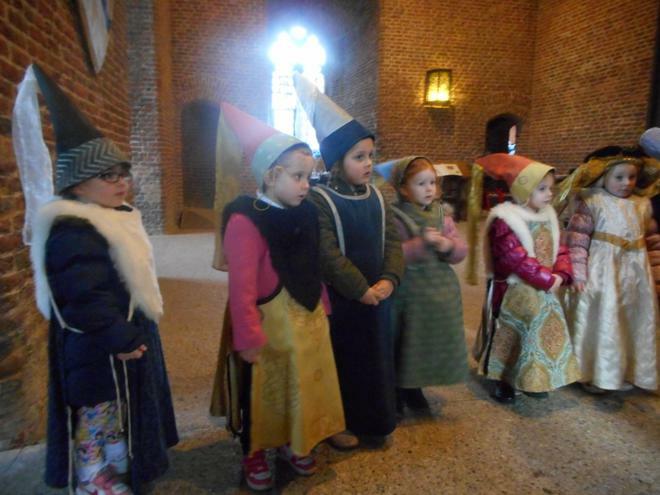 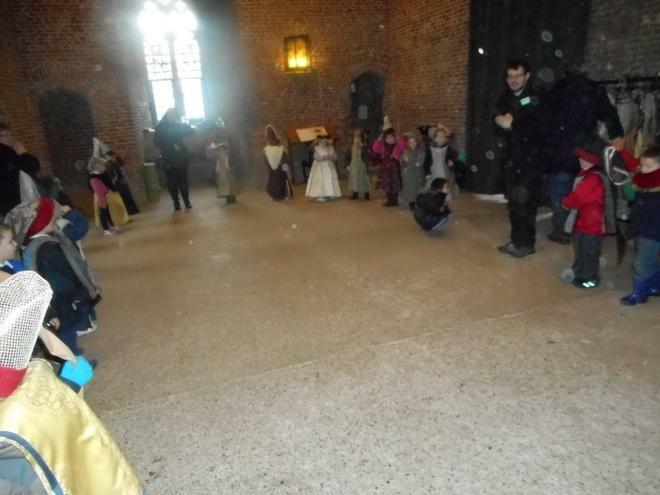 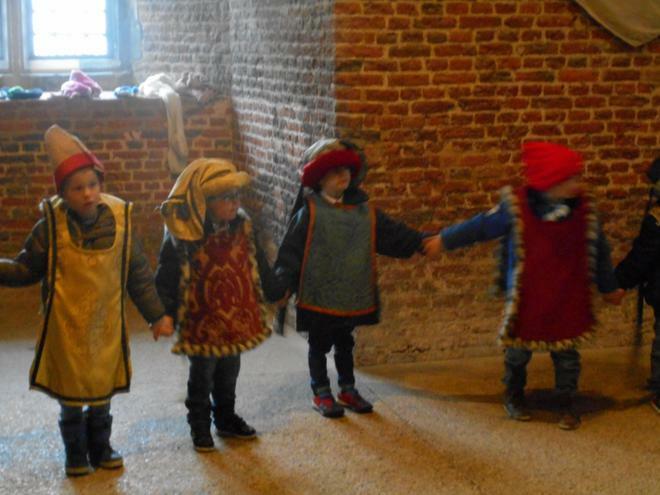 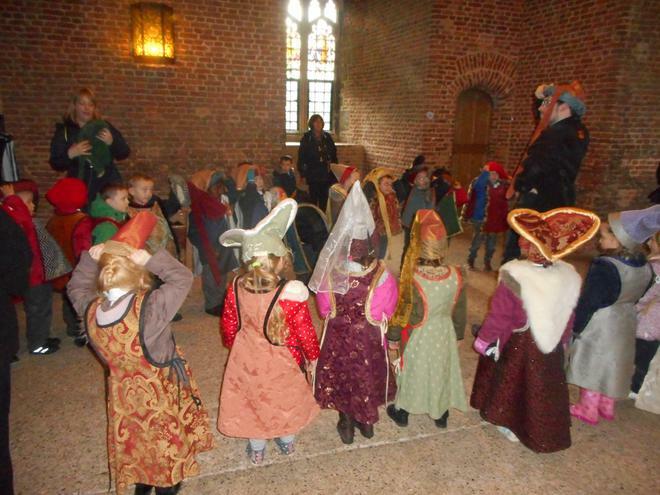 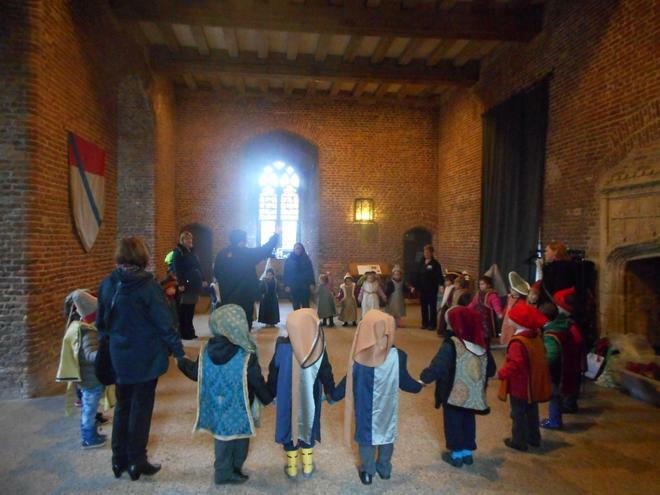 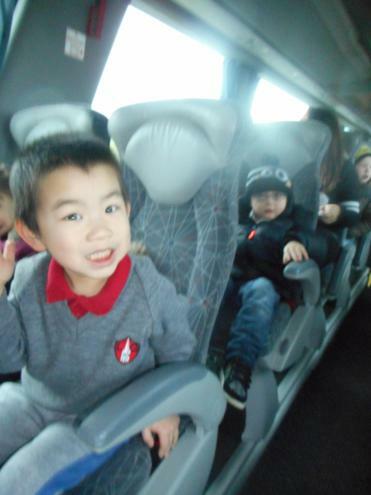 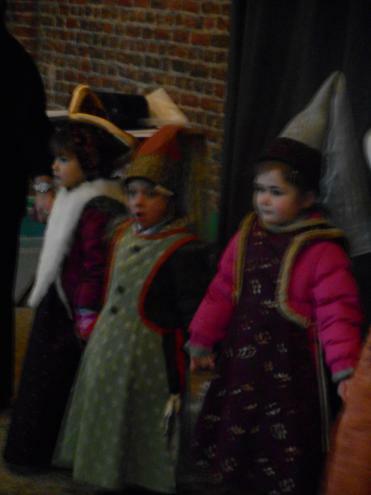 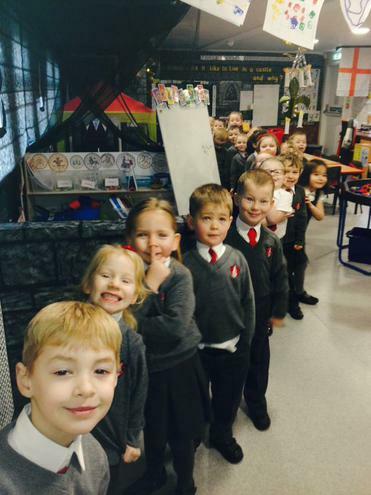 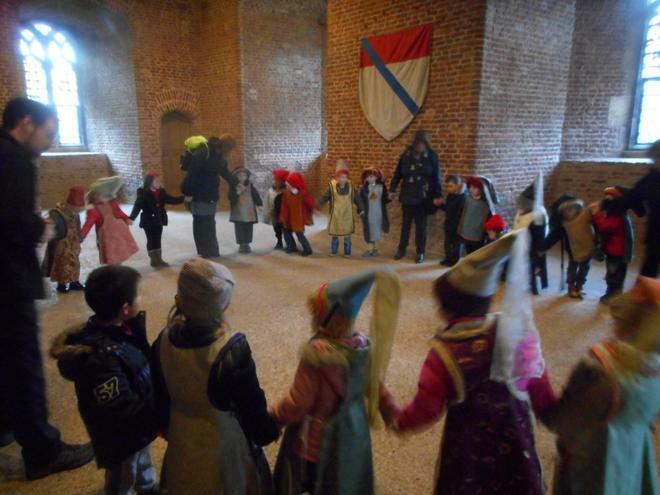 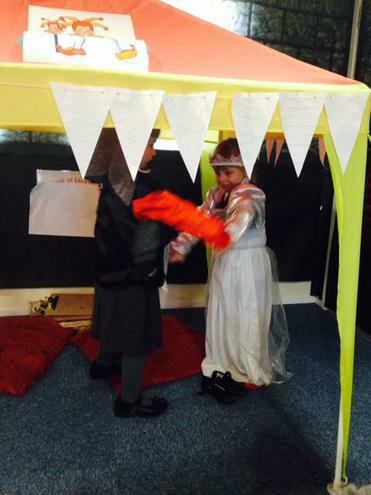 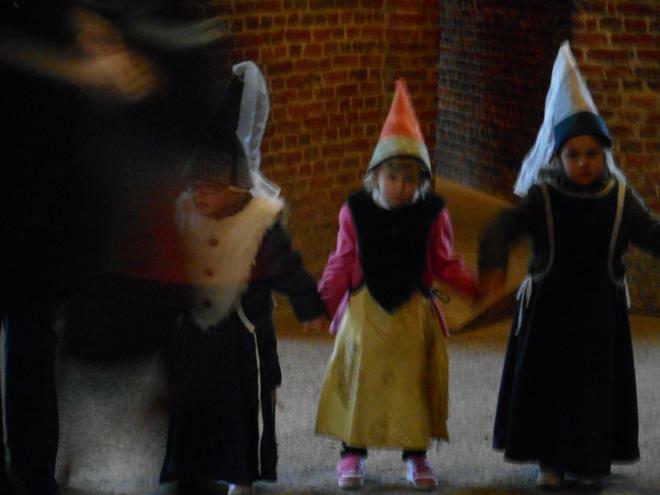 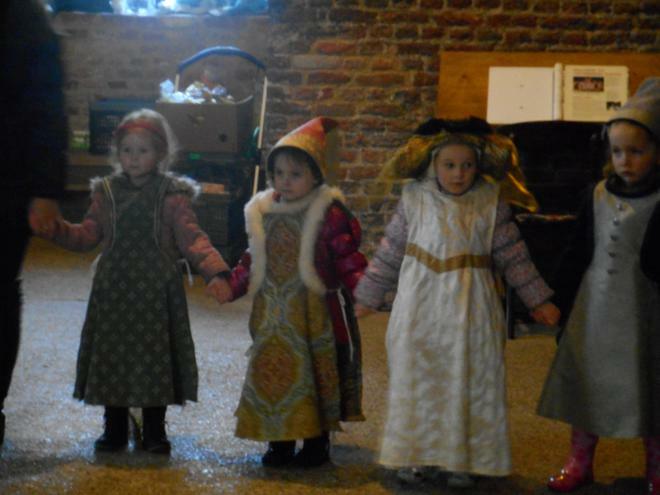 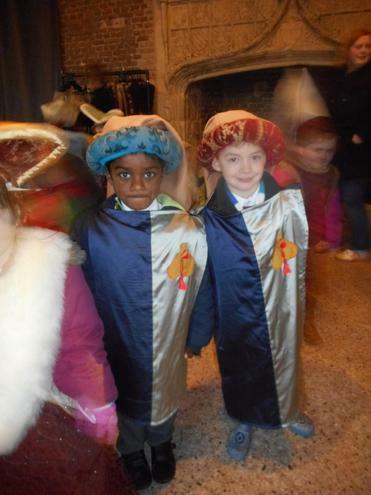 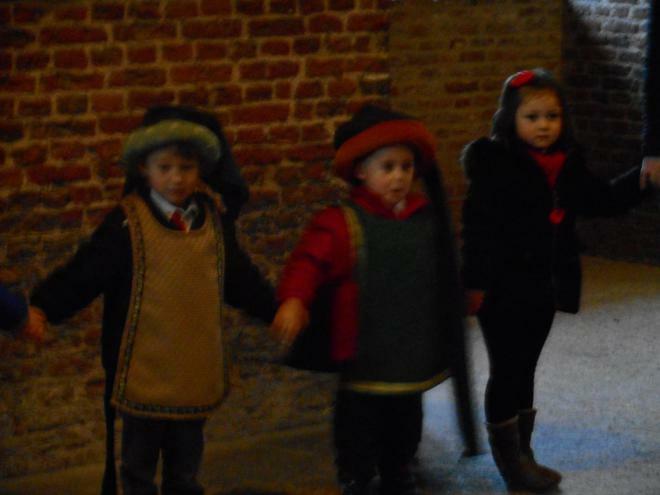 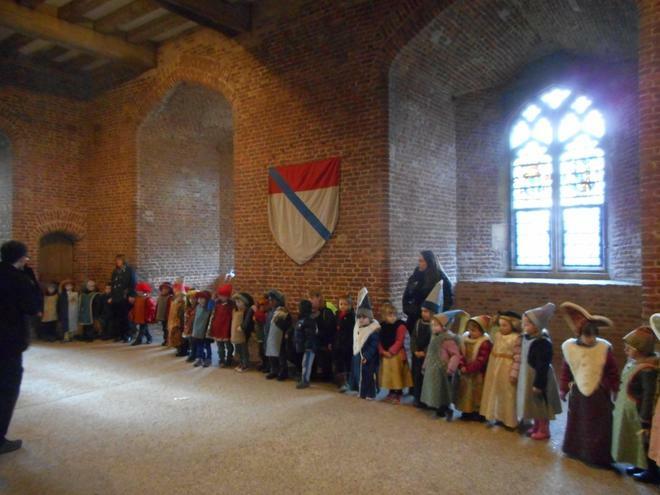 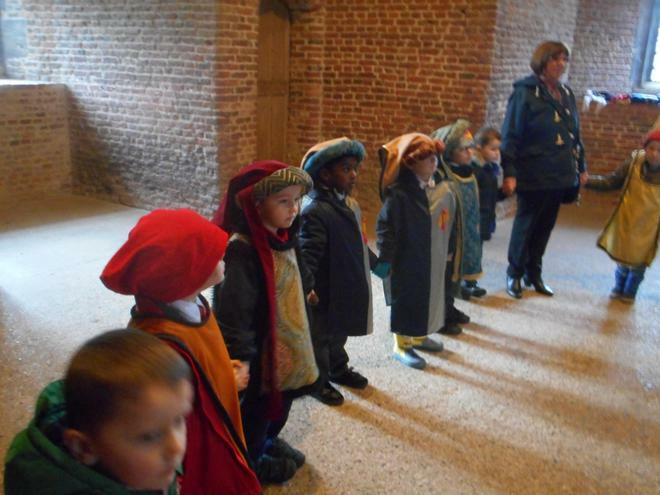 We were able to dress up as Prince, Princesses and Knights, and learnt some medieval dances. 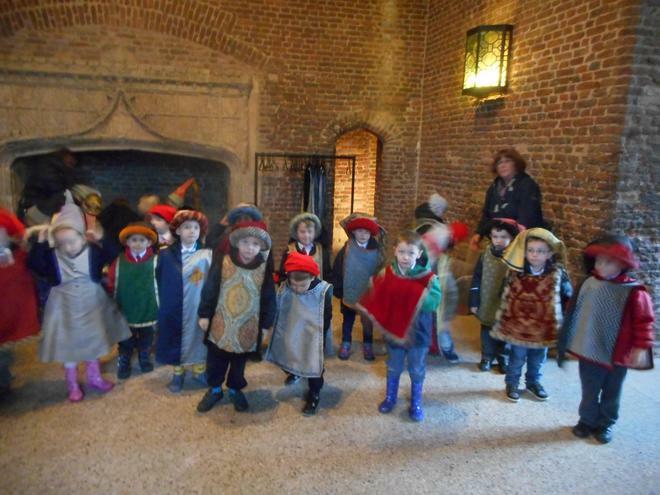 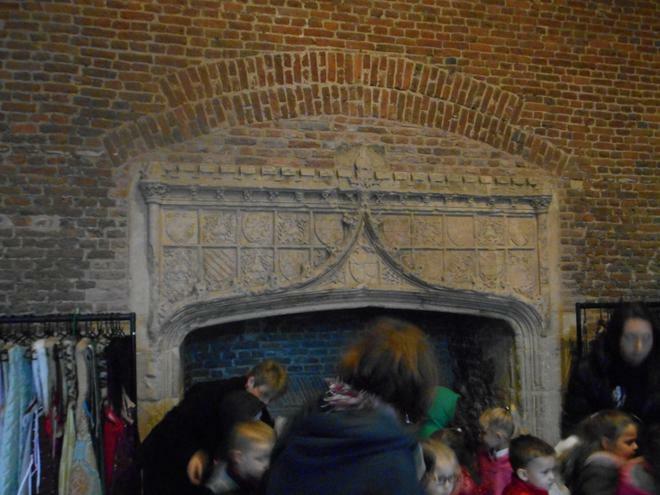 It really helped us to understand what it was like to live in a castle. 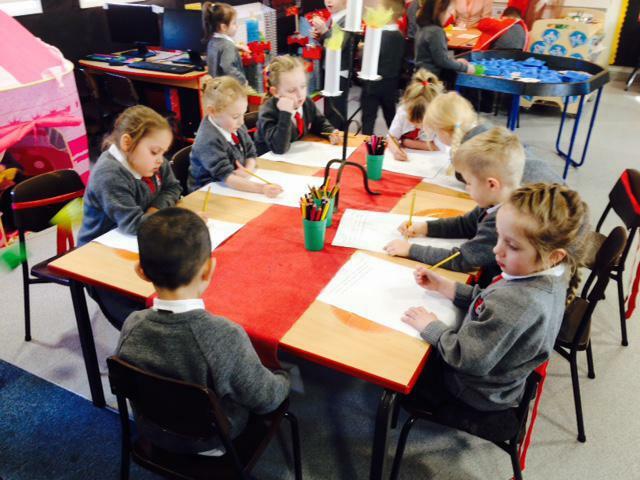 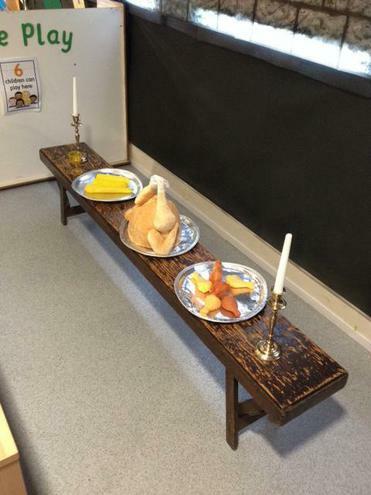 We had a week when we recieved lots of challenges. 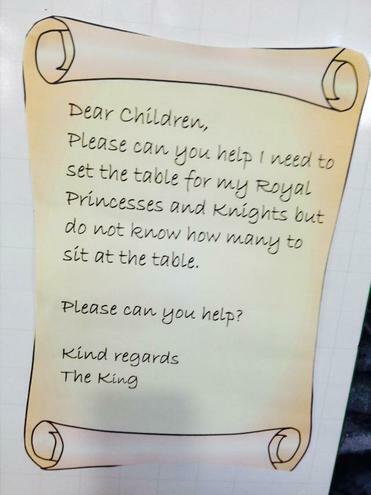 One was a scroll from the King asking us to find how many different ways he could seat the Prince and Princesses at his banqueting table. 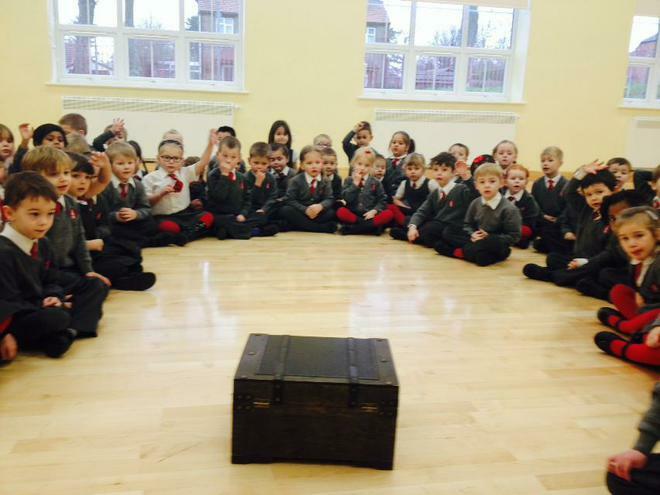 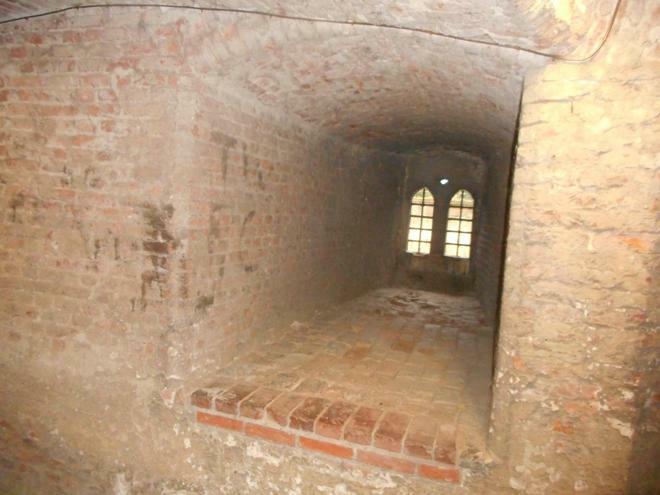 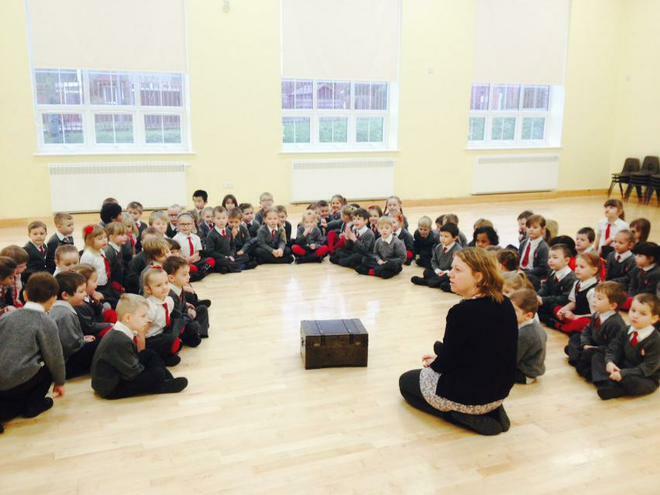 The other was a chest sent from Tattershall Castle - but it was locked! 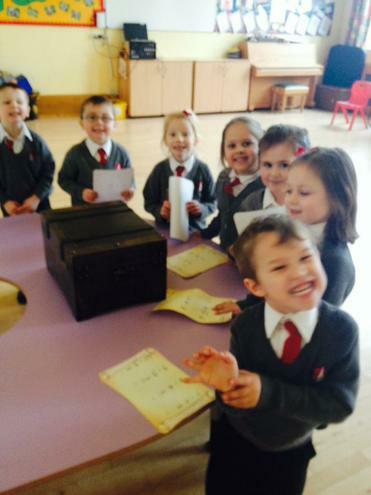 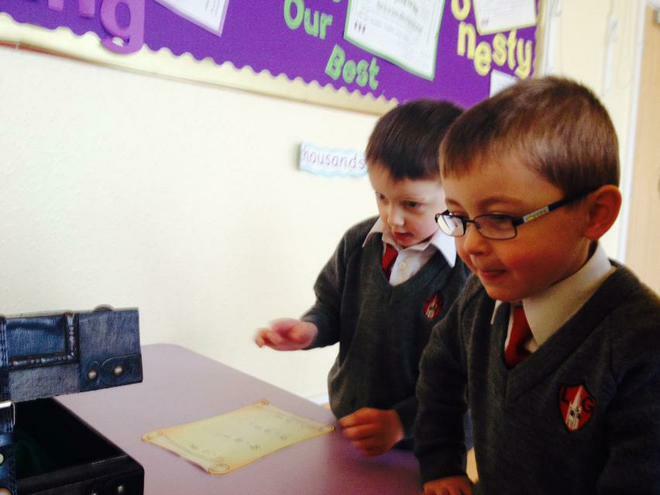 We had to solve the subtraction sums, to find the jewels, to unlock the chest! 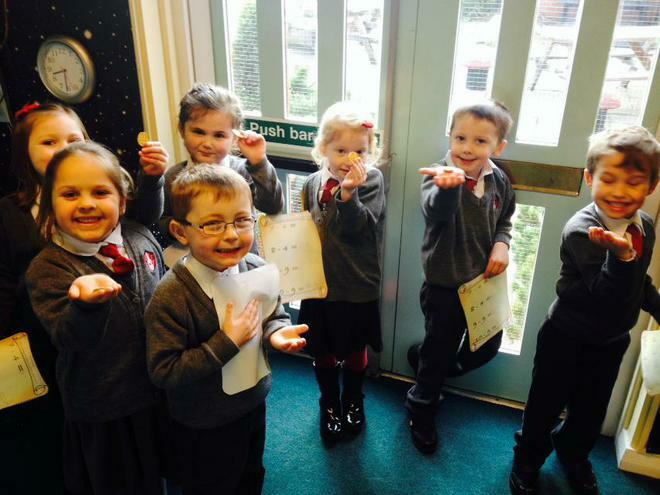 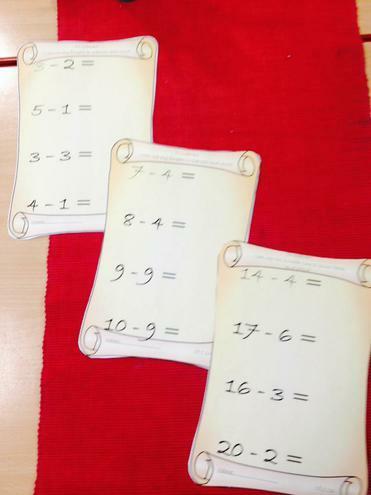 We used lots of different maths skills during the week to help us solve all the problems we faced. 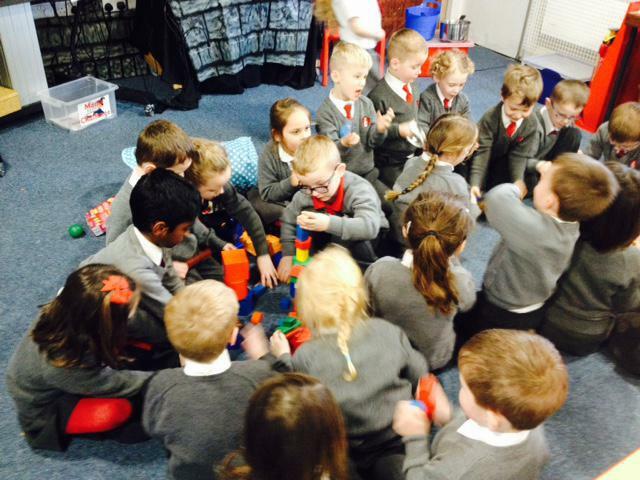 We had such fun! 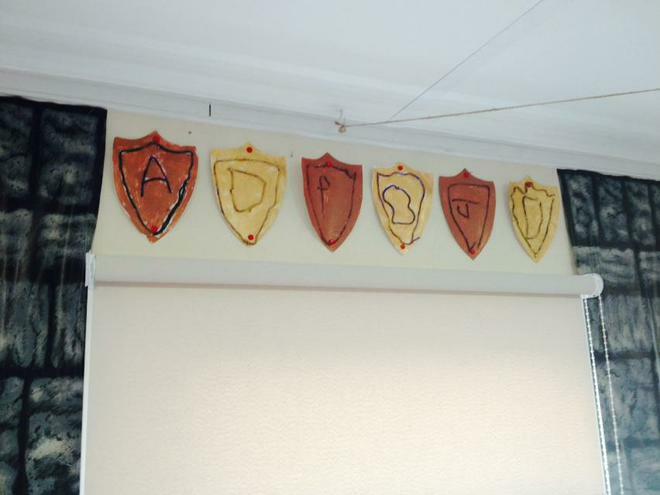 We wrote our initial in the middle of our shield, and then used glue and string to go over the top of the letter and around the edge. 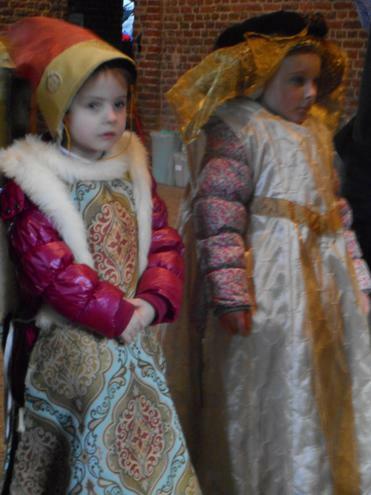 Then , when they were dry we painted them in 'metallic' colours, so they look like metal shields that a Knight might use. 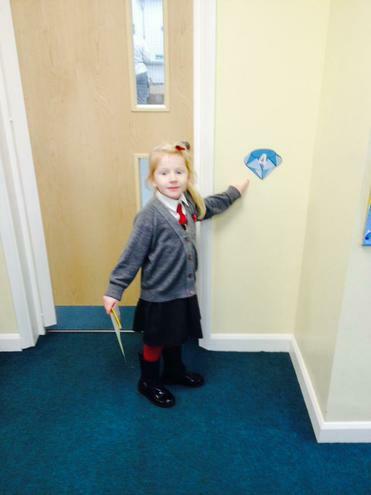 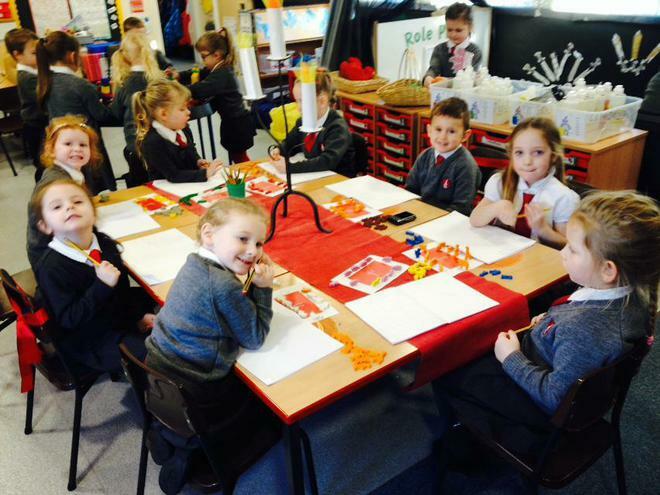 We're very proud of them and think they look fabulous in our classroom! 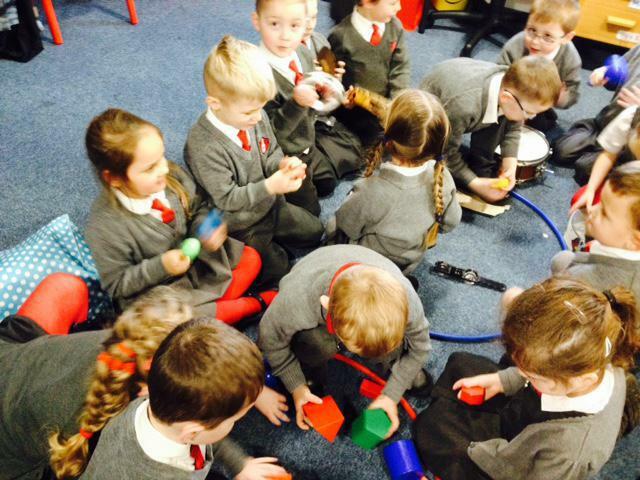 We have been exploring medieval and modern musical instruments. 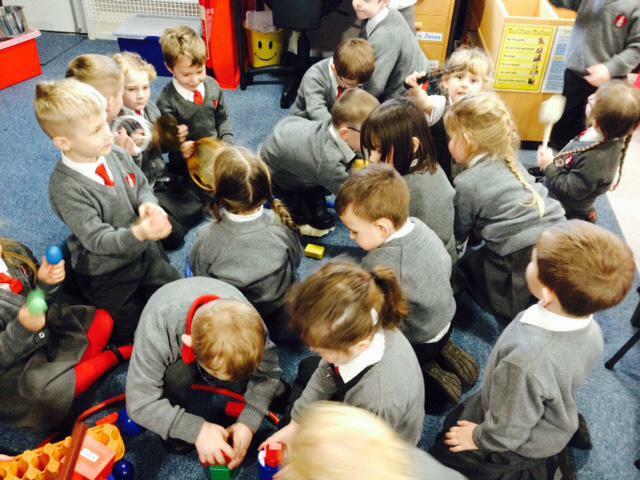 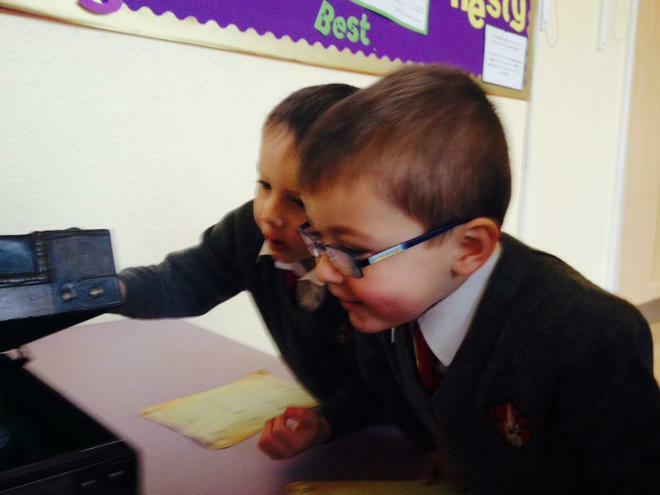 We enjoyed looking at a range of instruments, seeing which 3d shapes they were similar too, and finding everyday items that were the same shape. 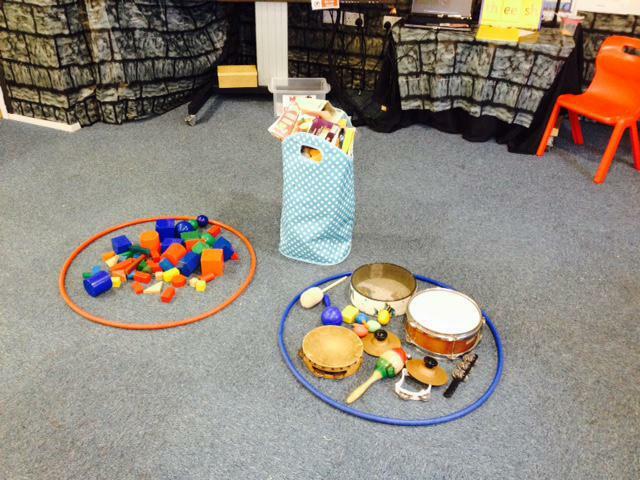 We made the instruments make lots of different noises. 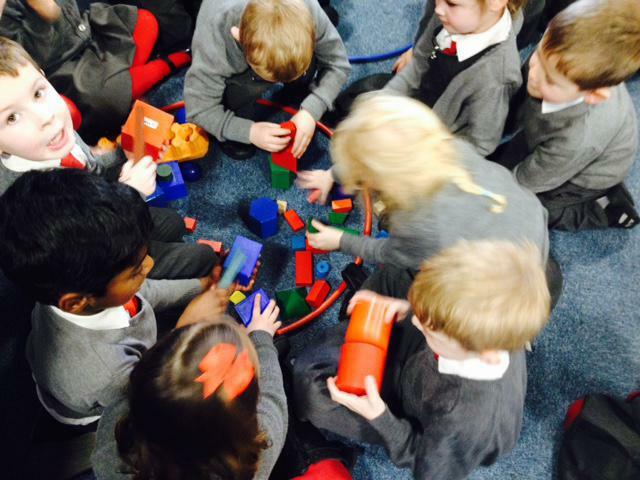 We sorted 3D shapes and matched them to everyday items, describing their shape. 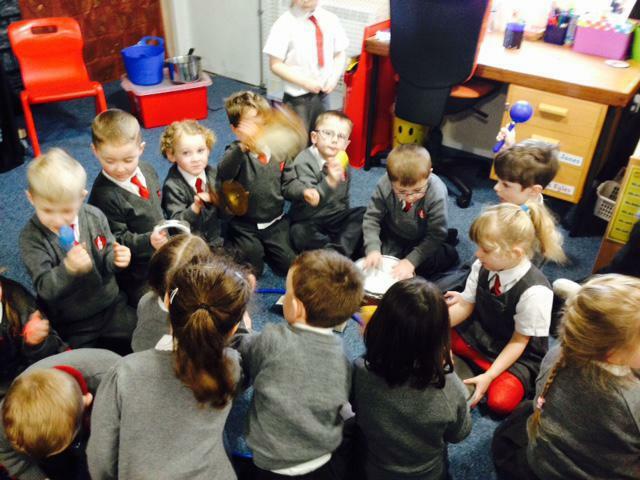 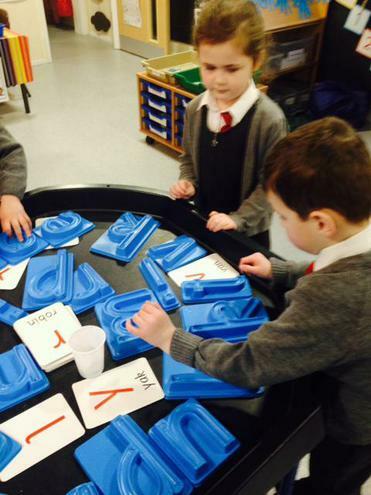 We then designed our own instruments, using the boxes and 'junk' to help us with our designs. 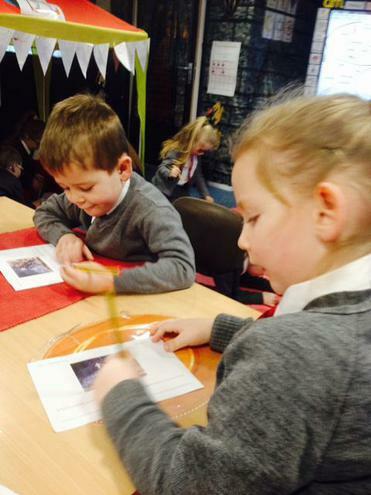 We have worked hard to follow our designs to make our instruments. 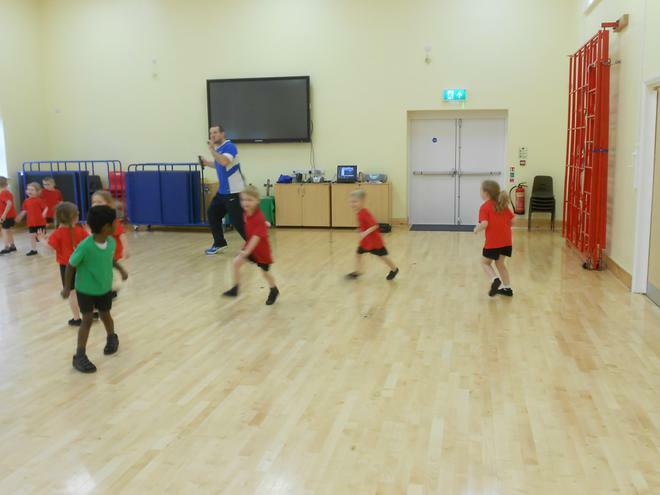 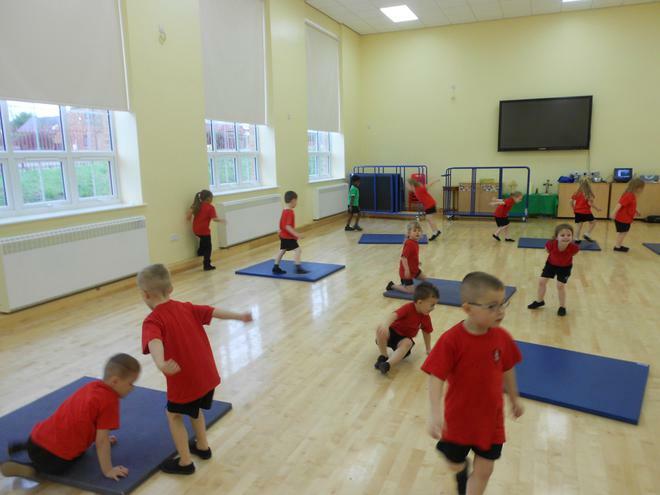 This term we have Mr Small teaching us gymnastics. 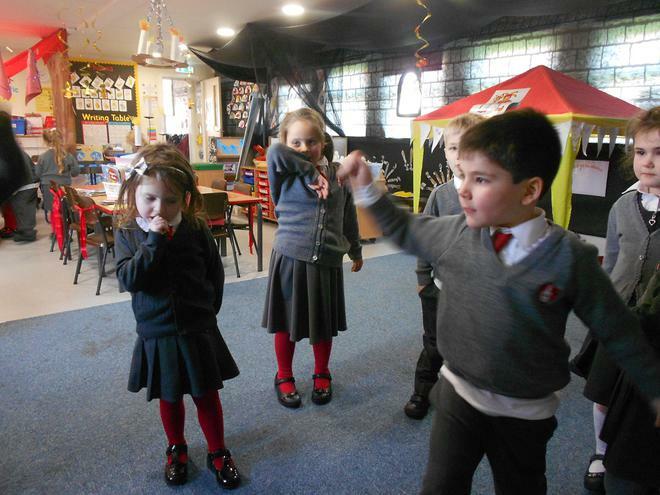 We really enjoy these sessions. 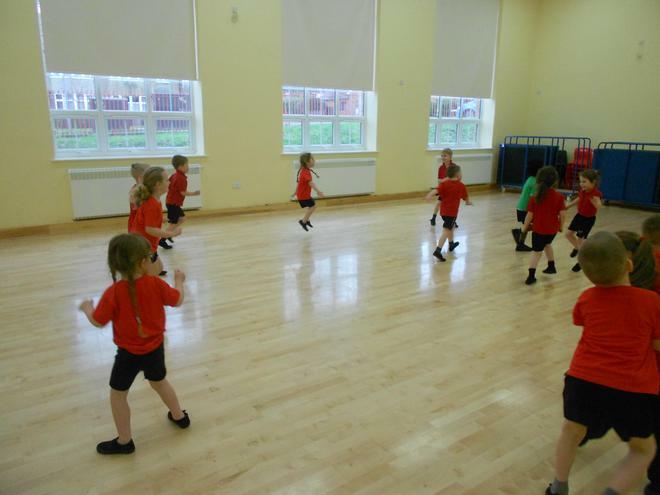 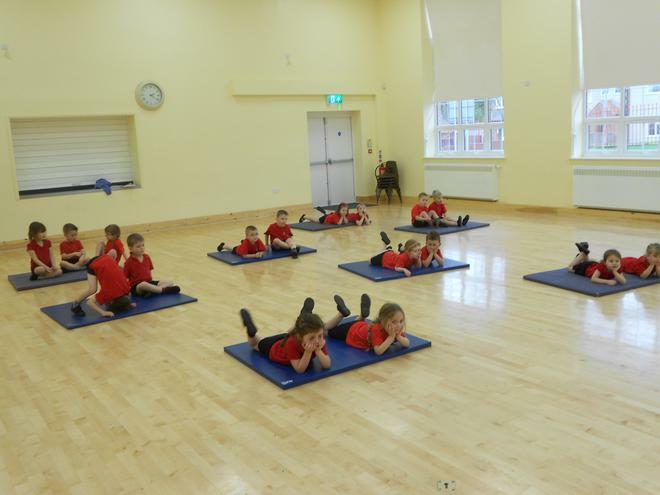 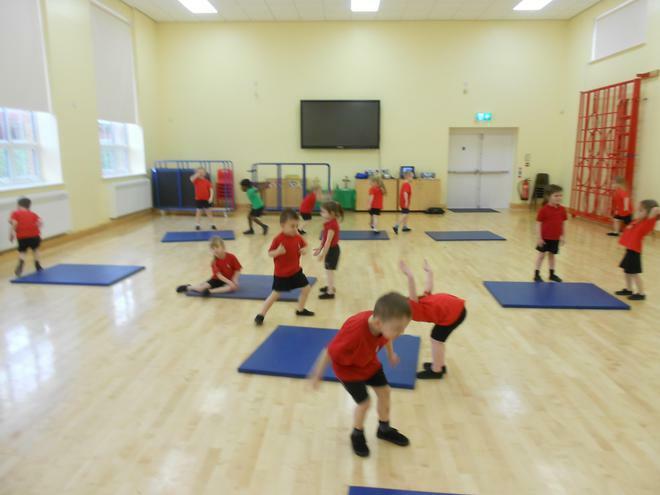 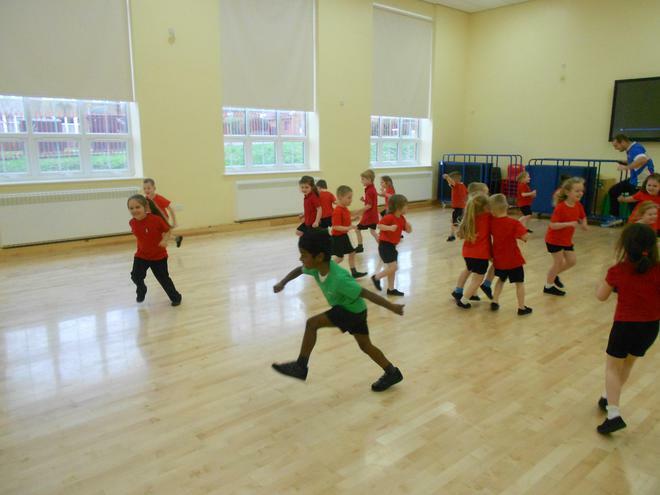 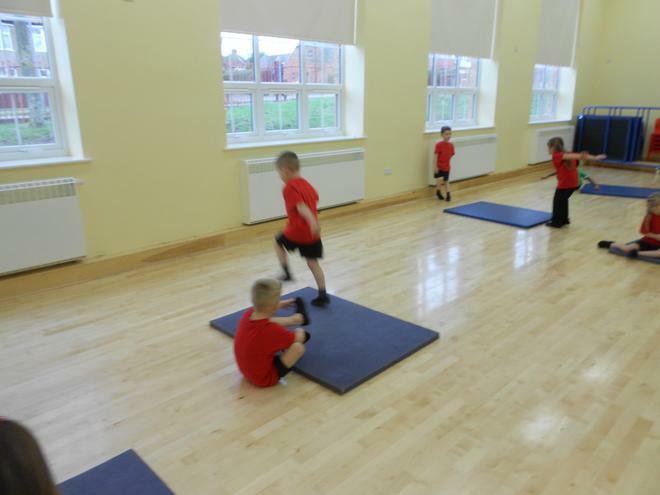 We are learning to move our bodies with control, move in between each other without bumping into our neighbours, move the mats safely, identify parts of our bodies and explore how to move them, and understand the effects of exercise on our bodies. 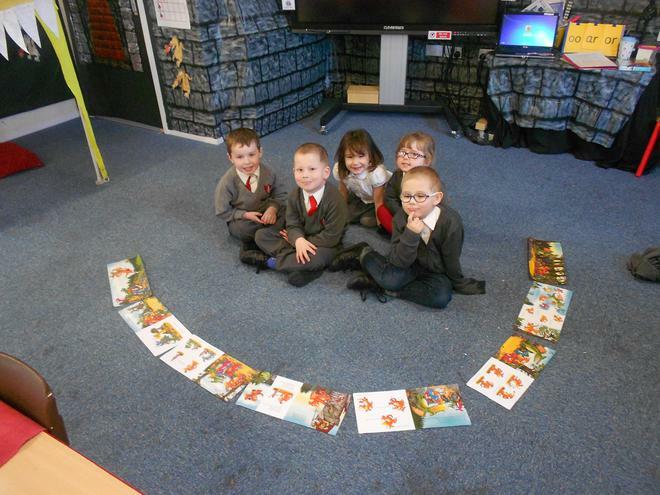 We have been story tellers this week. 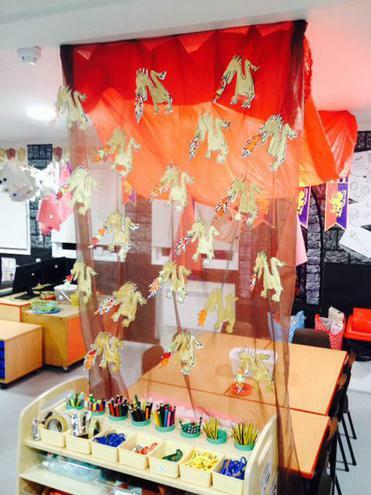 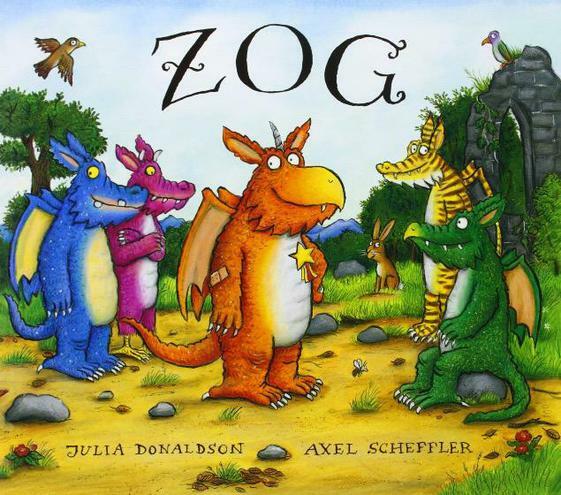 We have been reading and enjoying the story of Zog, a fantastic Julia Donaldson book in which we learn all about the dragon Zog and his time at Dragon School. 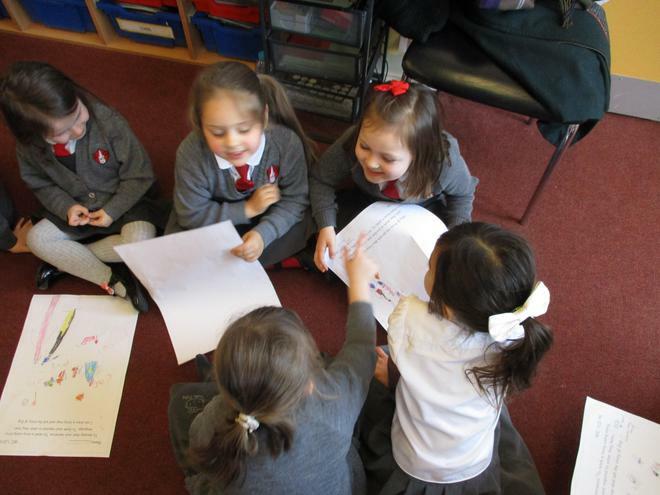 We have loved learning about the characters and setting, ordering pictures of the story, role playing and making finger puppets so we can retell the story to our friends. 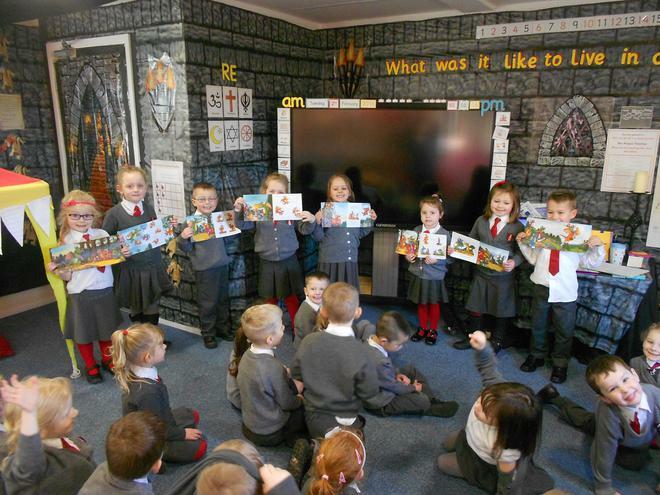 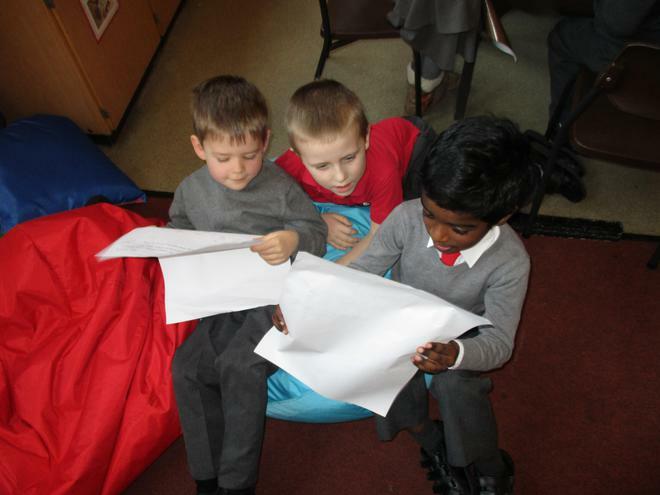 We had great fun sharing our Zog story maps with Amber Class.